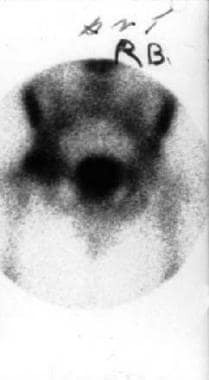 Anteroposterior (AP) radiographs (see image below) and frog lateral radiographs of both hips are the primary diagnostic modalities. Sensitivity and specificity is greater than 98%, which is higher than all other modalities. This study is ideal if x-ray findings are normal and clinical suspicion is high. 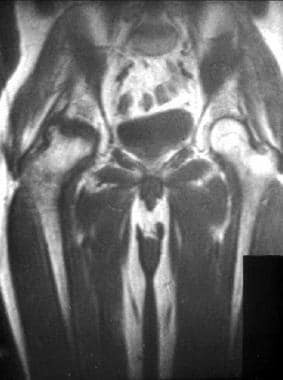 MRI should be performed in all patients with osteonecrosis to assess the extent of the disease. Three-dimensional MRI scanning with image registration may be used to assess changes in lesion size. 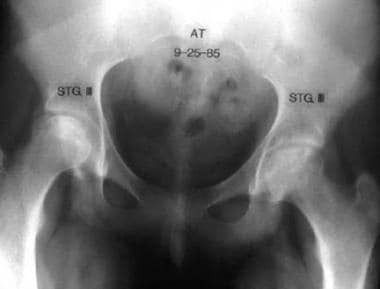 MRI is recommended to identify bilateral disease when 1 hip has radiographic signs of disease and the other is normal (see image below). 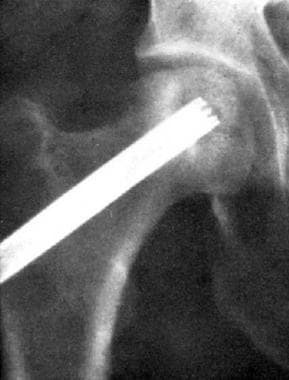 An open biopsy of 10-mm core of bone from the femoral head can be used for diagnosis. Measurement of interosseous pressure can be obtained before and after biopsy to confirm decompression of intraosseous space. Injection of contrast under image intensification has been used as part of the functional evaluation of bone when measuring intraosseous pressure. This can be used to confirm presence of the needle within the head and venous congestion. The first histologic findings are marrow and adipocyte necrosis. Next, liquefaction necrosis and interstitial edema occur. Pyknotic nuclei with empty lacunae are identified as osteocyte necrosis occurs. Eventually, the zone of necrosis is surrounded by repair tissue as revascularization proceeds. During this phase, the subchondral plate is weakened as resorption occurs faster than reformation, leading to subchondral collapse and eventual cartilage damage. Several radiographic staging systems are currently used.